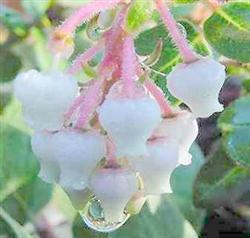 A medium size manzanita that is tolerant of most garden conditions and also tolerant of clay. John Dourley is much loved for its reddish bronze colored new growth. Older leaves are muted green. John Dourley’ Manzanita is a low, mounding shrub with grey green leaves and pink flowers, reddish new growth and blush-colored berries. Growing 2 to 3 feet tall and 6 feet wide, this plant requires full sun or partial shade and water once a month after establishment. Attractive year-round, it makes a great understory for mature trees or a foundation plant for large planters, parkways, banks or hillsides. Manzanitas provide nectar for hummingbirds, berries for songbirds and wonderful habitat for other native critters. John Dourley was the horticulture director at Rancho Santa Ana Botanic Garden in the 70’s. This manzanita was named for him by Mike Evans of Tree of Life Nursery.